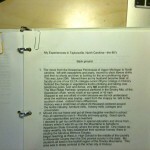 In my last post, I discussed my undisciplined experiment with digital storytelling. In my digital video, I reflected on my first-grade report card and was curious about why my “lack of self-disciple” was featured so prominently on it. Even as I was finishing up that video, I was troubled/unsettled/curious about my lack of context. While I briefly mentioned that I went to school in Hickory, North Carolina, I didn’t provide any details about the town or the state. Since I’m interested in the ways that calls for self-discipline have disturbing implications for folks who don’t fit the mythical (White) norm, it seems important to mention that 1980s North Carolina, particularly in the part of the state that I lived, near the foothills of the Smoky Mountains, was a racially charged and poverty stricken area (at least, right outside of the city of Hickory). It was also in a school district where corporeal punishment, in the form of paddling, was mandatory (I need to do some more research on that, but I’m pretty sure that I remember my mom, a junior high learning disabilities teacher, struggling with how to resist/reject this regulation). I’ve been thinking a lot lately about my whiteness and its impact on how my lack of self-discipline was handled by my teacher. As much as I can recall, I didn’t really get in that much “trouble” in that first grade class. Even though paddling was encouraged, I was never paddled. (It might have even been mandatory for teachers; I went to elementary school in the 1980s in North Carolina, at least partly known for its poverty, racism and corporeal punishment. I think I recall my mom, who taught in a different school, saying that she was told that she had to paddle misbehaving students). I wish I could remember more of my mom’s stories about her teaching experiences in North Carolina. I think she would have a lot to say about how non-white/poor white students were punished as troublemakers with corporeal punishment and by being placed in learning disabilities classrooms like hers. After posting this comment, I decided to quickly look through one of my mom’s notebooks (the same notebook where I found her reflections on throwing darts at the Censor and her poem about the dragonfly). 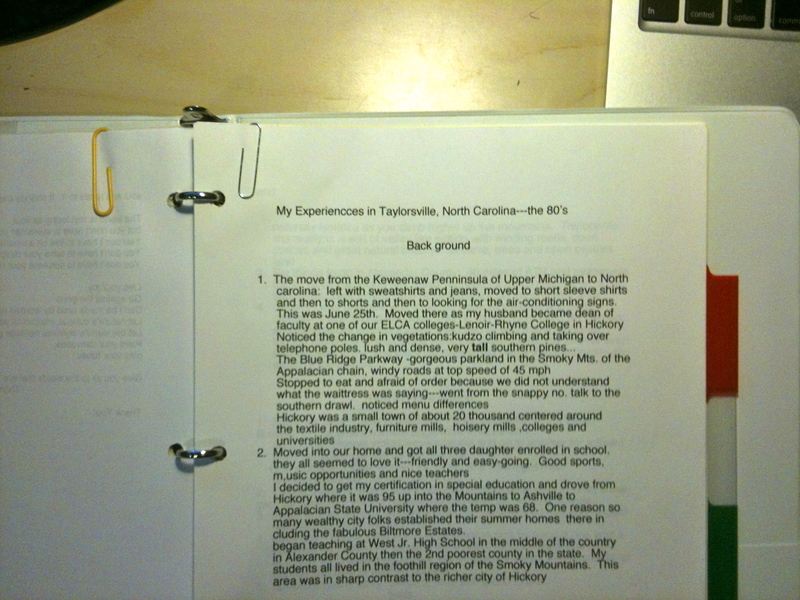 In it, I found some of her research notes for a presentation on Creativity and Weaving: “My Experiences in Taylorsville, North Carolina–the 80’s.” Jackpot! Well, not quite, but it’s a start. In these brief notes, my mom provides some context on 1980s North Carolina and a little bit of information about her experiences as a teacher during that time. She was a special education teacher (I remember that she called herself an LD–learning disabilities–teacher) at West Jr. High School “in the middle of the country in Alexander County, then the 2nd poorest county in the state.” She notes that the KKK was a big presence (with at least one teacher claiming membership) and that there was a sharp contrast in wealth between “the richer city of Hickory” (where I attended school) and her extremely poor students in rural Alexander County. She also briefly describes “discipline in the schools” as: “paddle–woodburned names, classroom chart with 3 demerits than a paddle.” I remember that from my first-grade class! Only once was I almost paddled. I had made it through the entire day without a single demerit. Then, in the last few minutes of school, I managed to earn three! For some reason, Mrs. Miller didn’t paddle me. Did I ever see her paddle any other students? I’m not sure. How did my mom handle the paddle rule in her classroom? Did she ever paddle her students? Did she refuse? If so, what were the consequences of that refusal? How did she manage her role as a teacher who was supposed to discipline students (and who was frequently given students who didn’t really have learning disabilities, but were just deemed “disciplinary problems”) with her role as a mother of someone who lacks (self) discipline? Did she witness any differences between how discipline functioned in “rich Hickory” and “poor Alexander county”? What did she think about these differences? Did they shape how she handled my disciplinary problems? Yes! I must continue to explore and trouble my undisciplined account. Also, our principal at the time was an African American man. I think my mom told him what happened. The day of the slapping, I remember walking home crying, and I know I told my mom what happened. I hated that teacher after that. And I hated that she treated me differently.